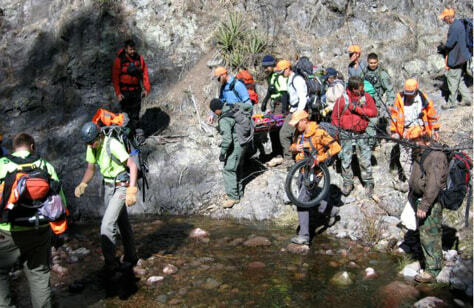 Rescuers transport missing hiker Margaret Page on March 7, 2012 inside the Gila National Forest, N.M. Page who had been missing for nearly a month, was found malnourished and emaciated but well-hydrated. Authorities believed she had probably stayed alive by drinking water from a nearby creek.